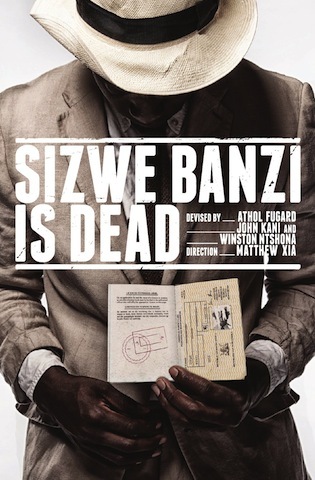 Athol Fugard‘s 1972 politically observant, Sizwe Banzi is Dead reflects on the power of the photograph. Created in collaboration with fellow playwrights John Kani and Winston Ntshona, the Tony Award nominated production becomes the megaphone for an oppressed generation. Marking the 20th anniversary of Nelson Mandela’s inauguration as the first black South African President, the production reflects on South Africa during the devastating Apartheid era. With the prospect of an obscure future looming over him, Sizwe Banzi finds himself conflicted between the possibility of living a new life or facing deportation. After the discovery of a pass book once belonging to a now deceased citizen, Sizwe’s world is turned upside down as he must make a life changing decision. Tonderai Munyevu‘s upbeat Styles narrates a bruising reality. A once oppressed factory worker turned photography business owner, Styles exuberantly illustrates the many individuals that seek to have their photographs taken by him. Breaking down the political barriers that once stood in his way, the photo booth becomes the epitome of humanity, a means to immortalise identities and to wander between the worlds of the past and the present. Sibusiso Mamba‘s jittering Sizwe Banzi awkwardly stumbles into the photo booth as he begins the process of adopting a new persona. Struggling to take the perfect picture, Mamba is comical and loveable as he exaggerates the contrived, manufactured nature of the photography process. The light hearted notion of the photograph over writes the more hard hitting intention of Sizwe’s pivotal decision to change his identity, abandoning the family in which he has helped to protect over the years. A decision that carries much weight, the overriding ultimatum between a new identity or the risk of deportation doesn’t appear as high in dramatic tension as it should be. Both Styles and Sizwe/Robert are likeable characters, however the characters could be more nuanced.